Even when we know what we SHOULD be doing with our back, sometimes this is easier said than done! Muscles often fire too much, and we need them to calm down, or they are lacking the endurance to do what we want them to do. Both of these situations can be helped with the correct application of different types of tape. All tapes have different purposes. Knowing how to correctly apply tape for your condition can really accelerate your training. However, using the wrong method may hinder your progress, so where possible please check with your dance teacher or therapist before trying it. Please note that you should never experience pain or increased tension from any tape application. Some individuals have a sensitivity to some of the components in the adhesive on tape. To test if you are sensitive to any type of tape, cut off a small square and apply to the soft skin on the inner forearm or stomach for at least 2 hours. If there is any redness or irritation it is not advisable to use this tape on your skin. There are various preparations on the market that may help to reduce sensitivity, so feel free to trial several to see which works for you. If you feel any irritation when tape is on your skin, remove it immediately to avoid skin damage. Irritation may occur if too much tension is applied to the area, or if it is applied over an area that undergoes a lot of movement. Sometimes you may need to try and reduce the activation of some muscles as they may fire too much, in a response to an underlying weakness, which can lead to sore back muscles and general overall tension. Often if the smaller stabilisers are not firing when they should, the body attempts to stabilise by chronically contracting the long Erector Spinae muscles. It’s not exactly accurate to say that the big muscles need to be “switched off” as they should be working in cooperation with the other muscles in your back, but it’s a good image to help reduce excessive tension. Using K-Tape is a good way to lessen the effort exerted by the big global back muscles to allow you to specifically train your other, deeper muscles that are the true stabilisers of your back. Improved control of these deeper back muscles ultimately leads to a more flexible and dynamically stable spine. Try this taping method if you find that you have lots of tension in your lower back or if you feel very sore in your big long back muscles after a full day. However, we do not recommend that you use this taping technique during class. Often the range of motion achieved is great, however, until you have the strength to control this new range of motion, the back may be unstable and vulnerable to injury. Use this taping technique to reduce firing in your big back muscles while you practice all of the deep core exercises in our A New Approach to Core Stability program. 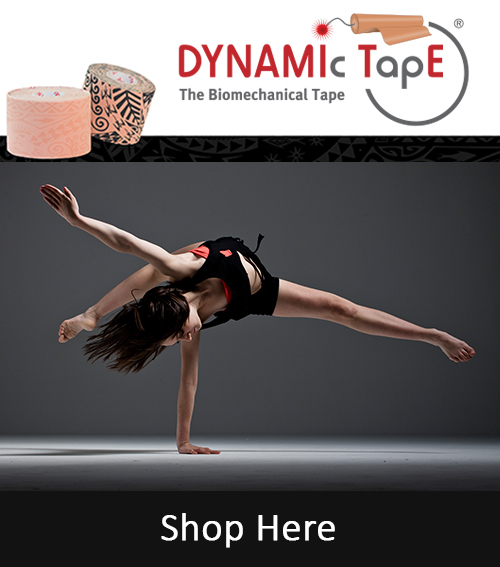 Dynamic Tape – Used to offload areas of strain and to support muscles. Dynamic Tape is a great tool for anyone who is trying to retrain certain muscles but finds that the muscles fatigue quickly. Often you can notice this by how long you can accurately hold your posture. People with weak deep core activation often have bad posture and sit in a flexed position when sitting at a desk or at a table, or find it challenging to stand for long periods. Even when you know WHAT to do, it may be hard to sustain a good position for an extended period of time, or you may simply forget when focused on an additional task. The effects of this habitually bad posturing can not only have long term effects on your core muscles but can also negatively impact on your digestion, mood and breath. With this Dynamic Taping technique, you can help to subconsciously train your brain into forgetting your old habits and adopting new, better habits. This is done by a process of constant feedback from the tape. When your back wants to tend into the slumped position, the tape will pull on the muscles and remind you to readjust your position to the better position. The tape has elastic properties and a recoil ability that means that when it is put on stretch, it will want to move back into its original position. Think of a bow when an arrow is fired. This taping technique also helps take the load off the bigger muscles helping you to improve your endurance over time. Watch the video below to see Lisa’s technique and see the tape in action. You will have to get a friend to help you with this one as positioning is key!